Motto: " Einigkeit und Recht und Freiheit "
West Germany, officially the Federal Republic of Germany (German : Bundesrepublik Deutschland), and referred to by historians as the Bonn Republic, was a country in Central Europe that existed from 1949 to 1990, when the western portion of Germany was part of the Western bloc during the Cold War. It was created during the Allied occupation of Germany in 1949 after World War II, established from eleven states formed in the three Allied zones of occupation held by the United States, the United Kingdom and France. Its capital was the city of Bonn. The term Wirtschaftswunder, also known as the Miracle on the Rhine, describes the rapid reconstruction and development of the economies of West Germany and Austria after World War II. The expression referring to this phenomenon was first used by The Times in 1950. 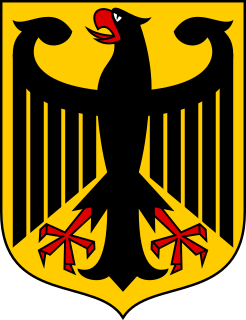 In East Germany, the terms Westdeutschland (West Germany) or westdeutsche Bundesrepublik (West German Federal Republic) were preferred during the 1950s and 1960s. 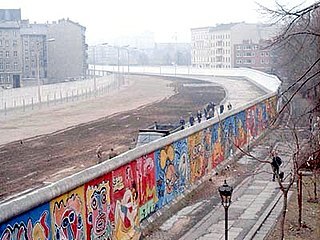 This changed once under its 1968 constitution, when the idea of a single German nation was abandoned by East Germany, and as a result West Germans and West Berliners were officially considered foreigners. In the early 1970s, starting in the East German Neues Deutschland , the initialism "BRD" (FRG) for the "Federal Republic of Germany" began to prevail in East German usage. In 1973, official East German sources adopted it as a standard expression and other Eastern Bloc nations soon followed suit. Neues Deutschland (nd) is a German daily newspaper, currently headquartered in Berlin. BRD ; is an unofficial abbreviation commonly used between 1968 and 1990 by the communist regime of the German Democratic Republic to refer to the Federal Republic of Germany, informally known at the time as West Germany. 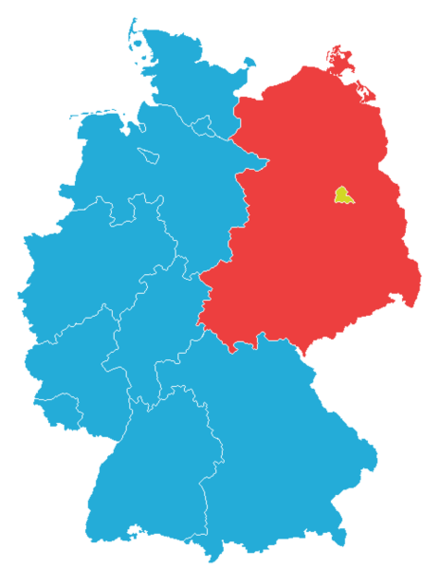 The East German regime previously used the term "German Federal Republic" to refer to its western counterpart. The Federal Minister of Intra-German Relations was a federal cabinet minister of the Federal Republic of Germany. The office was created under the title of Federal Minister of All-German Affairs in 1949, being also in charge of the German lands east of the Oder–Neisse line which had been put under Polish or Soviet administration. In 1951, the first Minister of All-German Affairs Jakob Kaiser openly raised claim to even greater territories including Austria, parts of Switzerland, the Saar area and Alsace-Lorraine. The Bundestag is the German federal parliament. It can be compared to the chamber of deputies along the lines of the United States House of Representatives or the House of Commons of the United Kingdom. Through the Bundesrat, a separate institution, the individual states of Germany participate in legislation similar to a second house in a bicameral parliament. With territories and frontiers that coincided largely with the ones of old Medieval East Francia and the 19th-century Napoleonic Confederation of the Rhine, the Federal Republic of Germany, founded on 23 May 1949, under the terms of the Bonn–Paris conventions it obtained "the full authority of a sovereign state" on 5 May 1955 (although "full sovereignty" was not obtained until the Two Plus Four Agreement in 1990). [lower-alpha 2] The former occupying Western troops remained on the ground, now as part of the North Atlantic Treaty Organization (NATO), which West Germany joined on 9 May 1955, promising to rearm itself soon. Though the EDC treaty was signed (May 1952), it never entered into force. France's Gaullists rejected it on the grounds that it threatened national sovereignty, and when the French National Assembly refused to ratify it (August 1954), the treaty died. The French Gaullists and communists had killed the French government's proposal. Then other means had to be found to allow West German rearmament. In response, at the London and Paris Conferences, the Brussels Treaty was modified to include West Germany, and to form the Western European Union (WEU). West Germany was to be permitted to rearm (an idea many Germans rejected), and have full sovereign control of its military, called the Bundeswehr . The WEU, however, would regulate the size of the armed forces permitted to each of its member states. Also, the German constitution prohibited any military action, except in the case of an external attack against Germany or its allies (Bündnisfall). Also, Germans could reject military service on grounds of conscience, and serve for civil purposes instead. Konrad Adenauer was 73 years old when he became chancellor, and for this reason he was initially reckoned as a caretaker. However, he stayed in power for 14 years. The grand old man of German postwar politics had to be dragged—almost literally—out of office in 1963. In 1959 it was time to elect a new President and Adenauer decided that he would nominate Erhard, the architect of the economic miracle. Erhard was not enthusiastic, and to everybody's surprise, Adenauer decided at the age of 83 that he would take on the position. He apparently believed that this would allow him to dominate the scene for up to ten more years in spite of the growing mood for change. However, when his advisers informed him that the powers of the president were almost entirely ceremonial, he quickly lost interest. An alternative candidate was needed and eventually the Minister of Agriculture, Heinrich Lübke took on the task and was duly elected. The calling in question of the actions and policies of government led to a new climate of debate. The issues of emancipation, colonialism, environmentalism and grass roots democracy were discussed at all levels of society. In 1979 the environmental party, the Greens, reached the 5% limit required to obtain parliamentary seats in the Free Hanseatic City of Bremen provincial election. Also of great significance was the steady growth of a feminist movement in which women demonstrated for equal rights. Until 1977 a married woman had to have the permission of her husband if she wanted to take on a job or open a bank account. Further reforms in 1979 to parental rights law gave equal legal rights to the mother and the father, abolishing the legal authority of the father. Parallel to this, a gay movement began to grow in the larger cities, especially in West Berlin, where homosexuality had been widely accepted during the twenties in the Weimar Republic. 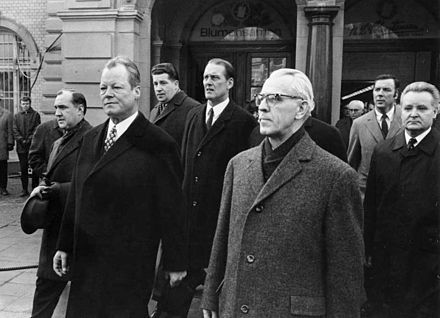 In the 1969 election, the SPD—headed by Willy Brandt—gained enough votes to form a coalition government with the FDP. Although Chancellor for only just over four years, Willy Brandt was one of the most popular politicians in the whole period. Brandt was a gifted speaker and the growth of the Social Democrats from there on was in no small part due to his personality. Brandt began a policy of rapprochement with West Germany's eastern neighbours, a policy opposed by the CDU. The issue of improving relations with Poland, Czechoslovakia and East Germany made for an increasingly aggressive tone in public debates but it was a huge step forward when Willy Brandt and the Foreign Minister, Walther Scheel (FDP) negotiated agreements with all three countries. (Moscow Agreement, August 1970, Warsaw Agreement, December 1970, Four Power Agreement over the status of West Berlin in 1971 and an agreement on relations between West and East Germany, signed in December 1972.) These agreements were the basis for a rapid improvement in the relations between east and west and led, in the long-term to the dismantlement of the Warsaw Treaty and the Soviet Union's control over Eastern Europe. Chancellor Brandt was forced to resign in May 1974, after Günter Guillaume, a senior member of his staff, was uncovered as a spy for the East German intelligence service, the Stasi . Brandt's contributions to world peace led to his nomination for the Nobel Peace Prize in 1971. The West German Wirtschaftswunder ("economic miracle", coined by The Times in 1950) was due to the economic aid provided by the United States and the Marshall Plan. [ citation needed ] This improvement was sustained by the currency reform of 1948 which replaced the Reichsmark with the Deutsche Mark and halted rampant inflation. The Allied dismantling of the West German coal and steel industry finally ended in 1950. In 1952 West Germany became part of the European Coal and Steel Community, which would later evolve into the European Union. On 5 May 1955 West Germany was declared to have the "authority of a sovereign state". [lower-alpha 2] The British, French and U.S. militaries remained in the country, just as the Soviet Army remained in East Germany. Four days after obtaining the "authority of a sovereign state" in 1955, West Germany joined NATO. The UK and the USA retained an especially strong presence in West Germany, acting as a deterrent in case of a Soviet invasion. 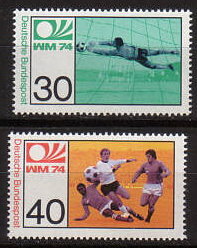 In 1976 West Germany became one of the founding nations of the Group of Six (G6). 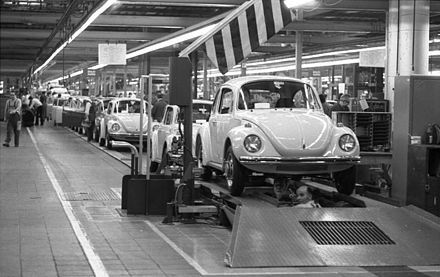 In 1973, West Germany—home to roughly 1.26% of the world's population—featured the world's fourth largest GDP of 944 billion (5.9% of the world total). In 1987 the FRG held a 7.4% share of total world production. Religious affiliation in West Germany decreased from the 1960s onward. Religious affiliation declined faster among Protestants than among Catholics, causing the Roman Catholic Church to overtake the EKD as the largest denomination in the country during the 1970s. In the early 1970s, Willy Brandt's policy of "Neue Ostpolitik " led to a form of mutual recognition between East and West Germany. The Treaty of Moscow (August 1970), the Treaty of Warsaw (December 1970), the Four Power Agreement on Berlin (September 1971), the Transit Agreement (May 1972), and the Basic Treaty (December 1972) helped to normalise relations between East and West Germany and led to both German states joining the United Nations. The Hallstein Doctrine was relinquished, and West Germany ceased to claim an exclusive mandate for Germany as a whole. Following the Ostpolitik the West German view was that East Germany was a de facto government within a single German nation and a de jure state organisation of parts of Germany outside the Federal Republic. The Federal Republic continued to maintain that it could not within its own structures recognise the GDR de jure as a sovereign state under international law; while at the same time acknowledging that, within the structures of international law, the GDR was an independent sovereign state. By distinction, West Germany then viewed itself as being within its own boundaries, not only the de facto and de jure government, but also the sole de jure legitimate representative of a dormant "Germany as whole". The two Germanys relinquished any claim to represent the other internationally; which they acknowledged as necessarily implying a mutual recognition of each other as both capable of representing their own populations de jure in participating in international bodies and agreements, such as the United Nations and the Helsinki Final Act. 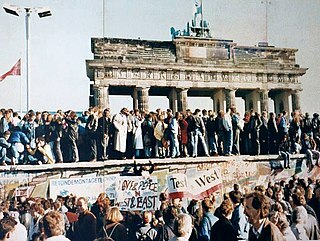 After the peaceful revolution of 1989 in East Germany, the Volkskammer of the GDR on 23 August 1990 declared the accession of East Germany to the Federal Republic under Article 23 of the Basic Law; and so initiated the process of reunification, to come into effect on 3 October 1990. 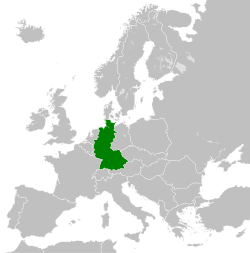 Nevertheless, the act of reunification itself (with its many specific terms and conditions; including fundamental amendments to the West German Basic Law) was achieved constitutionally by the subsequent Unification Treaty of 31 August 1990; that is through a binding agreement between the former GDR and the Federal Republic now recognising each another as separate sovereign states in international law. This treaty was then voted into effect on 20 September 1990 by both the Volkskammer and the Bundestag by the constitutionally required two-thirds majorities; effecting on the one hand, the extinction of the GDR and the re-establishment of Länder on the territory of East Germany; and on the other, the agreed amendments to the Basic Law of the Federal Republic. Amongst these amendments was the repeal of the very Article 23 in respect of which the GDR had nominally declared its postdated accession to the Federal Republic. Besides the interest in the older generation of writers, new authors emerged on the background of the experiences of war and after war period. Wolfgang Borchert, a former soldier who died young in 1947, is one of the best known representatives of the Trümmerliteratur . 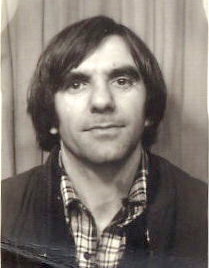 Heinrich Böll is considered an observer of the young Federal Republic from the 1950s to the 1970s, and caused some political controversies because of his increasingly critical view on society. [ citation needed ] The Frankfurt Book Fair (and its Peace Prize of the German Book Trade) soon developed into a regarded institution. Exemplary for West Germany's literature are – among others – Siegfried Lenz (with The German Lesson ) and Günter Grass (with The Tin Drum and The Flounder ). The West German government was known to be much more decentralised than its state socialist East German counterpart, the former being a federal state and the latter a unitary one. Whilst East Germany was divided into 15 administrative districts (Bezirke), which were merely local branches of the national government, West Germany was divided into states (Länder) with independently elected state parliaments and control of the Bundesrat , the second legislative chamber of the Federal Government. ↑ Though all stanzas were official, only the third stanza was sung in practice. Federal elections took place on 27 September 2009 to elect the members of the 17th Bundestag (parliament) of Germany. Preliminary results showed that the Christian Democratic Union (CDU), its Bavarian sister party, the Christian Social Union (CSU), and the Free Democratic Party (FDP) won the election, and the three parties announced their intention to form a new centre-right government with Angela Merkel as Chancellor. Their main opponent, Frank-Walter Steinmeier's Social Democratic Party (SPD), conceded defeat. 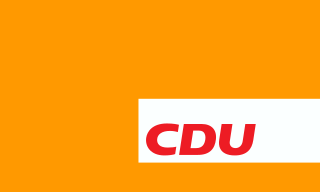 The Christian Democrats previously governed in coalition with the FDP in most of the 1949–1966 governments of Konrad Adenauer and Ludwig Erhard and the 1982–1998 governments of Helmut Kohl. ↑ Detlef Junker (editor), Translated by Sally E. Robertson, The United States and Germany in the Era of the Cold War Archived 23 September 2015 at the Wayback Machine , A Handbook Volume 1, 1945–1968 Series: Publications of the German Historical Institute ISBN 0-511-19218-5. See Section "The Presence of the Past" paragraph 9. ↑ Informationen für Politisch Bildung Heft 258, 1998, p. 3. ↑ Informationen zur Politische Bildung 258, p. 5. ↑ "RAF: Gefangen in der Geschichte". Die Zeit . 13 August 2011. Archived from the original on 8 May 2013. Retrieved 25 May 2013. ↑ Max Otte; Jürgen Greve (2000). A rising middle power? : German foreign policy in transformation, 1989–1999. ↑ "Zusammenfassende Übersichten - Eheschließungen, Geborene und Gestorbene 1946 bis 2015". DESTATIS - Statistisches Bundesamt. Archived from the original on 11 August 2018. Retrieved 11 August 2018. ↑ "Population by area in 1,000". DESTATIS - Statistisches Bundesamt. Archived from the original on 11 August 2018. Retrieved 11 August 2018. ↑ Includes Protestants outside the EKD. ↑ "Germany's post-war justice ministry was infested with Nazis protecting former comrades, study reveals". The Daily Telegraph. 10 October 2016. Archived from the original on 23 January 2019. Retrieved 23 January 2019. ↑ Tetens, T.H. The New Germany and the Old Nazis, New York: Random House, 1961 pages 37–40. ↑ Glenday, Craig (2013). Guinness World Records 2014. 2013 Guinness World Records Limited. p. 257. ISBN 978-1-908843-15-9.